JNN 08 Jan 2014 New York : A major snowstorm producing blizzard-like conditions hammered the northeastern United States on Friday, causing 2,000 U.S. flight delays and cancellations, paralyzing road travel, and closing schools and government offices. The first major winter storm of 2014 brought bone-chilling temperatures and high winds from the lower Mississippi Valley to the Atlantic coast, with nearly 2 feet of snow falling in some areas of Massachusetts. About 1,550 U.S. flights were canceled and 431 were delayed early on Friday, according to FlightAware.com, which tracks air traffic. New York’s John F. Kennedy International Airport suspended operations as the city’s three major airports prepared hundreds of cots to accommodate stranded travelers. 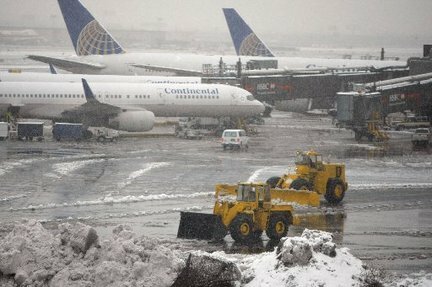 Boston’s Logan International Airport said that up to a quarter of its scheduled flights had been canceled on Thursday. The United Nations in New York and federal courts in New Jersey shut down, and New York public schools and the City University of New York closed. Schools were also closed in Hoboken and Jersey City, in New Jersey, and in Boston and Providence, Massachusetts. This entry was posted in America, United States and tagged City University of New York, John F. Kennedy International Airport, Massachusetts, New York, northeastern United States. Bookmark the permalink.